Brigadier General Donald Balch spent more than 8,500 hours flying planes ranging from the B-25 Mitchell bomber to the C-5 Galaxy but among his proudest achievements was leading the 440th Tactical Airlift Wing in Milwaukee. 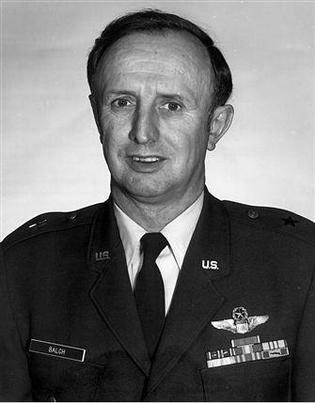 Balch commanded the 440th from 1979 until his retirement from the military in 1986; he earned his general's star while serving with the Milwaukee-based wing. The unit was relocated to North Carolina this year, and Balch traveled to Pope Air Force Base to attend the formal flag transfer ceremony in June. Balch, 76, died in a one-vehicle crash October 14, 2007, near his home in Bulverde, Texas. Balch was traveling alone on U.S. 281 north of San Antonio when his Jeep Cherokee went down an embankment and rolled over, according to Texas authorities. "The dedication he found at the 440th was outstanding. He had a lot of pride here," said his son Gareth Balch, a senior master sergeant who is a loadmaster in the 440th. While commanding the Milwaukee-based Air Force Reserve unit, Balch created the 440th Airlift Wing Community Council, a support group of volunteers from the business community. Born in Vermont, Balch earned a bachelor of science degree at the University of Vermont and a law degree from the New England School of Law. He received his commission and pilot wings in 1954 in Texas and, following a tour of active duty, joined the Air Force Reserve in 1961. He was commander of airlift wings at Dover Air Force Base in Delaware and Travis Air Force Base in California before his appointment to command the 440th. Of the 8,500-plus hours in the cockpit, Balch piloted the B-25, B-29, F-86, C-124, C-119, C-123, C-141, C-130 and the C-5. "He had a lot of fun flying," said Gareth Balch. "One thing I remember him saying was that when he first started flying the C-5 Galaxy, which was the world's largest aircraft at the time, he said he flew it around the world." Balch moved to Texas several years ago. His family remembered him as a vibrant spirit, an insatiable traveler, an avid reader of history and political events, an enthusiastic Republican and a tomato and jalapeño pepper farmer. Aside from his son, survivors include his wife, Mary; two daughters, Natalie and Jennifer; two sisters; and a brother. A funeral was held in Texas on October 19. A memorial service will be held at Fort Myer Chapel in Arlington, Virginia, on January 10, 2008, followed by interment at Arlington National Cemetery. Brigadier General Donald H. Balch, United State Air Force, a one time resident of Sudbury, Massachusetts, passed away at the age of 76 on October 14, 2007, near his home in Bulverde, Texas. He was born August 19, 1931, in Bellows Falls, Vermont to Ervin and Blanche (Johnson) Balch. He graduated with a Bachelor of Science Degree from the University of Vermont and earned a law degree from the New England School of Law in 1965. General Balch received his commission and pilot wings at Goodfellow Air Force Base in 1954. Following a tour of active duty, he entered the Air Force Reserve in 1961 and was assigned to the 731st Tactical Airlift Squadron at Hanscom Air Force Base. In 1973, he became Commander of the 512th Military Airlift Wing, Dover Air Force Base and in 1976 went on to command the 349th Military Airlift Wing, Travis Air Force Base. In 1979, General Balch was appointed Commander of the 440th Tactical Airlift Wing, General Mitchell Field. General Balch was a Command Pilot with over 8,500 hours flying time on more than a dozen aircraft, including the B-25, B-29, C-130, and the C-5. Decorations he received include the Legion of Merit, Armed Forces Reserve Medal, National Defense Service Medal, Vietnam Service Medal, Air Force Outstanding Unit Award, Air Force Longevity Service Award, Air Force Training Ribbon, and the Republic of Vietnam Gallantry Cross. He retired from the Air Force Reserve in 1986. General Balch was preceded in death by his parents; sister, Alice; and brother, Jimmy. He is survived by his wife of 16 years, Mary J. Balch; children, Gareth White Balch and wife Julie, Nathalie Garland Balch, and Jennifer Kakareka Balch and husband, Curtis Runyan; grandchildren, Molly, Alyssa; sister, Lora Underwood; brother, Harold Balch and wife, Marge; sister, Dottie Litchfield. Services were held on October 19, in San Antonio, Texas. An additional service will be held at Fort Myer Chapel at 12:45 on January 10, 2008 followed by internment at Arlington National Cemetery. BALCH DONALD H. BALCH (Age 76) Brigadier General, USAF (Retired) Passed away on October 14, 2007, near his home in Bulverde, Texas. Born in Vermont, he graduated from the University of Vermont and earned a law degree from the New England School of Law. He received his commission and pilot wings in 1954 and, following a tour of active duty, joined the Air Force Reserve in 1961. General Balch was a Command Pilot who logged more than 8,500 hours flying planes such as the B-25 Mitchell bomber and the C-5 Galaxy transport aircraft. Among his proudest achievements was leading the 440th Tactical Airlift Wing in Milwaukee. He retired from the Air Force Reserve in 1986. He is survived by his wife, Mary, children Gareth, Nathalie, and Jennifer, and two grandchildren. Funeral service and interment with Full Military Honors will be held at 12:45 p.m., January 10 at Arlington National Cemetery.